Go for the Gold With This Template! Olympic fever is here! This year, over 90 countries are competing for medals in PyeongChang, South Korea. The games will feature more than 100 events--it’s the first time in Winter Olympic history that there will be more than 100 medal events! While the Olympic games don’t officially start until February 9th, our Creative Team has designed a new Winter Games template to give your digital signage a headstart on the Olympic excitement! 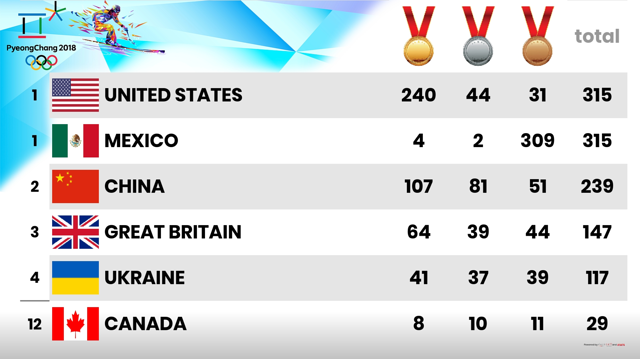 The template, which is included for free with all paid plans, captures the thrill of the games by displaying the medal count of the top six countries. The page is updated automatically using the web page widget, so there’s no additional work needed on your part! Engaging and timely content that everyone will be talking about! No work on your part! How could you go wrong?! If these digital signage templates aren’t for you, or if you have ideas for other templates, we’d love to hear about them. We update our template library regularly using input from our users. Drop us a line here.